Vincent "Vinnie" Asaro, who was charged Thursday in the infamous $6 million heist at a Lufthansa airline cargo hold in 1978, comes from a long line of reputed mobsters. 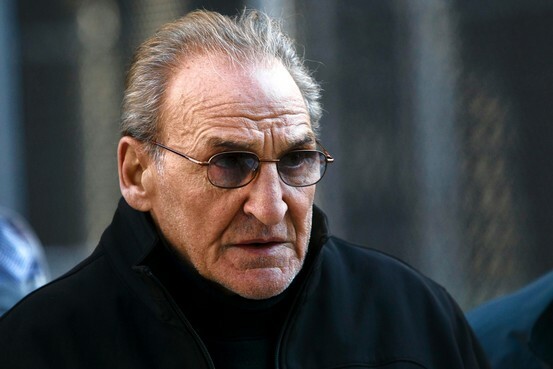 Several of the 78-year-old alleged Bonanno crime family captain's relatives were known to authorities as members of organized crime, law-enforcement officials said. And Mr. Asaro's 55-year-old son, Jerome "Jerry" Asaro, was indicted with him as part of Thursday's racketeering case, though he hasn't been charged in the Lufthansa robbery. Both pleaded not guilty and his lawyer declined to comment. "I really don't think there should be guilt by association," said Mr. Asaro's lawyer, Gerald McMahon, adding that the "sins" of his relatives should not be cast upon his client. Mr. McMahon said he plans to prevail at trial and watch his client walk out of court "a free man." But federal prosecutors charged Mr. Asaro with a career's worth of racketeering charges, including murder, extortion, arson and armed robbery. Court documents chronicle the ups and downs of a man who prosecutors said was dedicated "to a life of crime." Mr. Asaro was inducted into the Bonanno crime family as an official "made" member decades ago—and for a time was in a crew headed by a relative, according to court documents. One of his earliest acts, prosecutors charged, was strangling Paul Katz to death with a dog chain in December 1969. Mr. Asaro believed Mr. Katz was cooperating with authorities, prosecutors said. The body was buried in concrete beneath a Queens house. Mr. Asaro was childhood friends with James "Jimmy the Gent" Burke—they grew up together in Ozone Park, Queens. Though Mr. Burke was allegedly an associate in the Lucchese crime family and prosecutors said Mr. Asaro is a Bonanno, they remained close—Mr. Asaro named Mr. Burke as his son's godfather, law-enforcement officials said, and they traveled in the same circles. Mr. Burke, now dead, was the suspected mastermind of the Lufthansa heist, which at the time was the highest-value robbery in U.S. history and was subsequently central to the plot of the popular film "Goodfellas." In December 1978, masked men held Lufthansa terminal workers at gunpoint while taking about $5 million in cash and about $1 million worth of jewelry from a vault. Mr. Burke was never charged in the robbery. But Mr. Asaro's alleged role in the crime remains unclear. Joe Coffey, who at the time was commanding officer of the NYPD's Organized Crime and Homicide Task Force and investigated the Lufthansa case, said Mr. Asaro had a hands-on role. December 1969: Killed associate Paul Katz over concerns he was a government informant. December 1978: Took part in the Lufthansa Airlines cargo robbery, which netted about $6 million in cash and jewelry. Early 1980s: Directed two men to burn down a nightclub in Ozone Park. Mid-1980s: Involved in a robbery of a Federal Express employee and a conspiracy to steal $1.25 million from an armored car business. Several years later: Demoted to soldier for mistreating his workers. Early 2000: Begins reporting to his son, Jerome, a captain. 2012 or 2013: Reinstated as a captain. "He was definitely a lookout," said Mr. Coffey, who remembers regularly tailing Mr. Asaro in those days. "They brought him along so Burke could give him a piece of the pie. He was a minor player at best." But Mr. Asaro's name didn't come up in an investigation by the Justice Department's since-disbanded Federal Organized Crime Strike Force, a person familiar with that probe said. In Nicholas Pileggi's book "Wiseguy," which served as the basis for the film "Goodfellas" and devoted several chapters to the heist, Mr. Asaro is mentioned by mob associate Henry Hill as "the Bonanno family's crew chief out at the airport." Four cooperating witnesses have said in court papers that Mr. Asaro participated in the robbery. One of those, a cousin of Mr. Asaro who became a government informant, said he participated in the planning of the heist at Mr. Asaro's "direction," according to court documents. In 2011, the cousin-informant recorded Mr. Asaro saying, "we never got our money," and said Mr. Burke "kept everything." After the robbery, Mr. Asaro told his cousin to bring an "attaché case filled with gold and jewelry" to his superior—the Bonanno family's boss at the time, according to court papers. Mr. Asaro became a captain in the early 1990s and was in charge of his own crew of men. But a second cooperating witness "who was acting boss at that time of the Bonanno family," stripped him of the position, court papers state. The cooperating witness told authorities that Mr. Asaro was demoted to the position of "soldier" because "he was abusing his leadership position by 'robbing' the individuals who reported to him," the court papers state. Mr. Asaro was a "loan shark and a habitual gambler," the court papers allege. In the early 2000s, Mr. Asaro reported to his son, Jerome, who was captain of his father's old crew, the court papers state. By July 2012, Mr. Asaro was still reporting to his son, whom Mr. Asaro had promoted to acting captain years earlier when he was still a captain. However, after several ranking Bonanno members became government cooperators, Mr. Asaro was again made a captain by a new family boss in 2012 or 2013, court papers allege. Mr. Asaro has been arrested 21 times—dating back to 1957—for crimes including bank robbery, kidnapping, assault and possession of a loaded firearm, court papers state. Many of those charges were dismissed, according to court papers. In 1998, he was sentenced to four to 12 years for enterprise corruption and other charges—his first conviction since 1972, when he served six months for burglarizing a post office, court papers state. Mr. Asaro is being held in jail pending a bail hearing. Prosecutors said—even at his age—they believe Mr. Asaro "will continue to engage in violence and to direct others to commit violent acts" if granted bail.